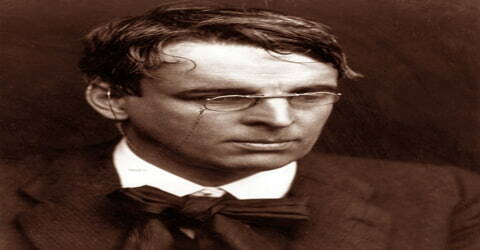 B. Yeats – Irish poet. W.B. 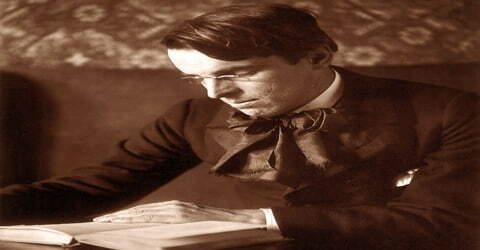 Yeats was one of the greatest English-language poets of the 20th century, was born on June 13, 1865, in Dublin, Ireland. A pillar of the Irish literary establishment, he helped to found the Abbey Theatre, and in his later years served as a Senator of the Irish Free State for two terms. He was a driving force behind the Irish Literary Revival along with Lady Gregory, Edward Martyn, and others. He won the Nobel Prize for literature in 1923. 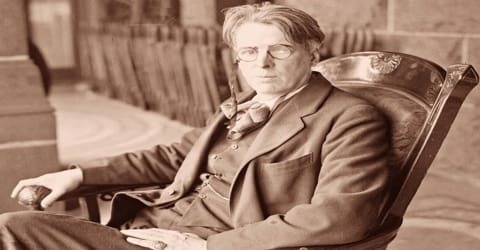 The works of William Butler Yeats form a bridge between the romantic poetry of the nineteenth century and the hard clear language of modern poetry. He spent childhood holidays in County Sligo and studied poetry from an early age when he became fascinated by Irish legends and the occult. These topics feature in the first phase of his work, which lasted roughly until the turn of the 20th century. His earliest volume of verse was published in 1889, and its slow-paced and lyrical poems display debts to Edmund Spenser, Percy Bysshe Shelley, and the poets of the Pre-Raphaelite Brotherhood. From 1900, his poetry grew more physical and realistic. He largely renounced the transcendental beliefs of his youth, though he remained preoccupied with physical and spiritual masks, as well as with cyclical theories of life. His early accomplishments include The Wanderings of Oisin and Other Poems (1889) and such plays as Countess Kathleen (1892) and Deirdre (1907). In 1923, he was awarded the Nobel Prize for Literature. He went on to pen more influential works, including The Tower (1928) and Words for Music Perhaps and Other Poems (1932). 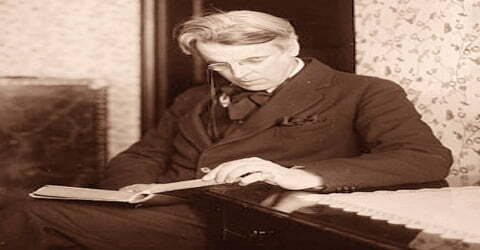 William Butler Yeats was born June 13, 1865, Sandymount, Dublin, Ireland. His father, John Butler Yeats (1839–1922), was a descendant of Jervis Yeats, a Williamite soldier, linen merchant, and well-known painter who died in 1712. Benjamin Yeats, Jervis’s grandson, and William’s great-great-grandfather had in 1773 married Mary Butler of a landed family in County Kildare. Following their marriage, they kept the name Butler. Mary was a descendant of the Butler of Ormond family from the Neigham (pronounced Nyam) Gowran branch. By his marriage, William’s father John Yeats was studying law but abandoned his studies to study art at Heatherley School of Fine Art in London. His mother, Susan Mary Pollexfen, came from a wealthy merchant family in Sligo, who owned a milling and shipping business. At first, the Yeats children were educated at home. Their mother entertained them with stories and Irish folktales. John provided an erratic education in geography and chemistry and took William on natural history explorations of the nearby Slough countryside. On 26 January 1877, the young poet entered the Godolphin school, which he attended for four years. In 1879 the family moved to Bedford Park taking a two-year lease on 8 Woodstock Road. For financial reasons, the family returned to Dublin toward the end of 1880, living at first in the suburbs of Harold’s Cross and later Howth. In October 1881, Yeats resumed his education at Dublin’s Erasmus Smith High School. At the age of nineteen Yeats enrolled in the Metropolitan School of Art in Dublin, intending to become a painter. In 1887 he became a literary correspondent for two American newspapers. Among his acquaintances at this time were his father’s artist and writer friends, including William Morris (1834–1896), George Bernard Shaw (1856–1950), and Oscar Wilde (1856–1900). In March 1888 the family moved to 3 Blenheim Road in Bedford Park. The rent on the house was £50 a year. The Butler Yeats family were highly artistic; his brother Jack became an esteemed painter, while his sisters Elizabeth and Susan Mary known to family and friends as Lollie and Lily became involved in the Arts and Crafts movement. In 1889, Yeats met Maud Gonne, a 23-year-old English heiress and ardent Irish Nationalist. She was eighteen months younger than Yeats and later claimed she met the poet as a “paint-stained art student.” He also became acquainted with Maud Gonne, a supporter of Irish independence. This revolutionary woman served as a muse for Yeats for years. He even proposed marriage to her several times, but she turned him down. He dedicated his 1892 drama Countess Kathleen to her. Maud Gonne liked and admired him, but she was not in love with him. Her passion was lavished upon Ireland; she was an Irish patriot, a rebel, and a rhetorician, commanding in voice and in person. When Yeats joined in the Irish nationalist cause, he did so partly from conviction, but mostly for love of Maud. When Yeats’s play Cathleen ni Houlihan was first performed in Dublin in 1902, she played the title role. It was during this period that Yeats came under the influence of John O’Leary, a charismatic leader of the Fenians, a secret society of Irish nationalists. His only other love affair during this period was with Olivia Shakespear, whom he first met in 1894, and parted from in 1897. By 1916, Yeats was 51 years old and determined to marry and produce an heir. His rival John MacBride had been executed for his role in the 1916 Easter Rising, so Yeats hoped that his widow might remarry. His final proposal to Maud Gonne took place in mid-1916. 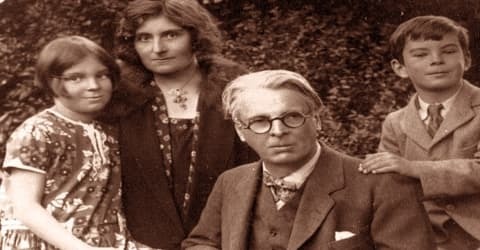 Soon after their wedding, Yeats’s new wife developed the power of automatic writing (writing as though coming from an outside source) and began to utter strange phrases in her sleep that she thought were dictated by spirits from another world. Yeats copied down these fragments and incorporated them into his occult aesthetic system, published as A Vision in 1925. A daughter, Anne Butler Yeats, was born in 1919, and a son, William Michael, two years later. At the age of 69, he was ‘rejuvenated’ by the Steinach operation which was performed on 6 April 1934 by Norman Haire. For the last five years of his life, Yeats found a new vigour evident from both his poetry and his intimate relations with younger women. During this time, Yeats was involved in a number of romantic affairs with, among others, the poet and actress Margot Ruddock, and the novelist, journalist and sexual radical Ethel Mannin. After returning to London in the late 1880s, Yeats met writers Oscar Wilde, Lionel Johnson, and George Bernard Shaw. Around this time, Yeats founded the Rhymers’ Club poetry group with Ernest Rhys. He also joined the Order of the Golden Dawn, an organization that explored topics related to the occult and mysticism. While he was fascinated with otherworldly elements, Yeats’s interest in Ireland, especially its folktales, fueled much of his output. The title work of The Wanderings of Oisin and Other Poems (1889) draws from the story of a mythic Irish hero. Meanwhile, Yeats was beginning to write: his first publication, two brief lyrics, appeared in the Dublin University Review in 1885. When the family moved back to London in 1887, Yeats took up the life of a professional writer. He joined the Theosophical Society, whose mysticism appealed to him because it was a form of imaginative life far removed from the workaday world. The age of science was repellent to Yeats; he was a visionary, and he insisted upon surrounding himself with poetic images. He began a study of the prophetic books of William Blake, and this enterprise brought him into contact with other visionary traditions, such as the Platonic, the Neoplatonic, the Swedenborgian, and the alchemical. In 1896, Yeats was introduced to Lady Gregory by their mutual friend Edward Martyn. 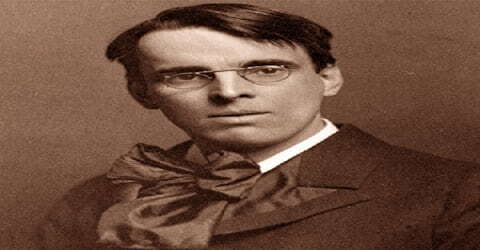 Gregory encouraged Yeats’s nationalism and convinced him to continue focusing on writing drama. Although he was influenced by French Symbolism, Yeats concentrated on an identifiably Irish content and this inclination was reinforced by his involvement with a new generation of younger and emerging Irish authors. 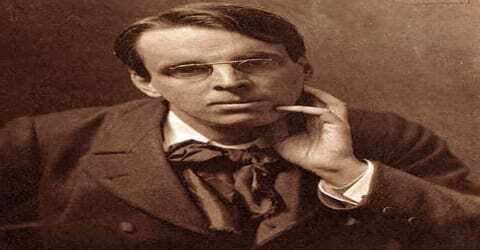 Together with Lady Gregory, Martyn, and other writers including J. M. Synge, Seán O’Casey, and Padraic Colum, Yeats was one of those responsible for the establishment of the “Irish Literary Revival” movement. Apart from these creative writers, much of the impetus for the Revival came from the work of scholarly translators who were aiding in the discovery of both the ancient sagas and Ossianic poetry and the more recent folk song tradition in Irish. One of the most significant of these was Douglas Hyde, later the first President of Ireland, whose Love Songs of Connacht was widely admired. The American poet Ezra Pound (1885–1972) came to London for the specific purpose of meeting Yeats in 1909. Pound served as Yeats’s secretary off and on between 1912 and 1916. Pound introduced Yeats to the Japanese No drama (a form of Japanese theater similar in many ways to Greek tragedy). Yeats’s verse dramas (plays in the form of poetry) reflect the ceremonial formality and symbolism of No. Yeats was already a proud young man, and his pride required him to rely on his own taste and his sense of artistic style. He was not boastful, but spiritual arrogance came easily to him. His early poems, collected in The Wanderings of Oisin, and Other Poems (1889), are the work of an aesthete, often beautiful but always rarefied, a soul’s cry for release from circumstance. In addition to his poetry, Yeats devoted significant energy to writing plays. He teamed with Lady Gregory to develop works for the Irish stage, the two collaborating for the 1902 production of Cathleen Ni Houlihan. Around that time, Yeats helped found the Irish National Theatre Society, serving as its president and co-director, with Lady Gregory and John Millington Synge. More works soon followed, including On Baile’s Strand, Deirdre and At the Hawk’s Well. In 1902, he helped set up the Dun Emer Press to publish work by writers associated with the Revival. This became the Cuala Press in 1904, and inspired by the Arts and Crafts Movement, sought to “find work for Irish hands in the making of beautiful things.” From then until its closure in 1946, the press which was run by the poet’s sisters produced over 70 titles; 48 of them books by Yeats himself. In the crucial period from 1899 to 1907, he managed the theatre’s affairs, encouraged its playwrights (notably John Millington Synge), and contributed many of his own plays. Among the latter that became part of the Abbey Theatre’s repertoire is The Land of Heart’s Desire (1894), Cathleen ni Houlihan (1902), The Hour Glass (1903), The King’s Threshold (1904), On Baile’s Strand (1905), and Deirdre (1907). Yeats published several volumes of poetry during this period, notably Poems (1895) and The Wind Among the Reeds (1899), which are typical of his early verse in their dreamlike atmosphere and their use of Irish folklore and legend. But in the collections In the Seven Woods (1903) and The Green Helmet (1910), Yeats slowly discarded the Pre-Raphaelite colors and rhythms of his early verse and purged it of certain Celtic and esoteric influences. The years from 1909 to 1914 mark a decisive change in his poetry. The otherworldly, ecstatic atmosphere of the early lyrics has cleared, and the poems in Responsibilities: Poems and a Play (1914) show a tightening and hardening of his verse line, a more sparse and resonant imagery, and a new directness with which Yeats confronts reality and its imperfections. Yeats met the American poet Ezra Pound in 1909. Pound had traveled to London at least partly to meet the older man, whom he considered “the only poet worthy of serious study.” From that year until 1916, the two men wintered in the Stone Cottage at Ashdown Forest, with Pound nominally acting as Yeats’s secretary. The relationship got off to a rocky start when Pound arranged for the publication in the magazine Poetry of some of Yeats’s verse with Pound’s own unauthorized alterations. These changes reflected Pound’s distaste for Victorian prosody. A more indirect influence was the scholarship on Japanese Noh plays that Pound had obtained from Ernest Fenollosa’s widow, which provided Yeats with a model for the aristocratic drama he intended to write. The first of his plays modelled on Noh was At the Hawk’s Well, the first draft of which he dictated to Pound in January 1916. In the 1930s Yeats was fascinated with the authoritarian, anti-democratic, nationalist movements of Europe, and he composed several marching songs for the far right Blueshirts, although they were never used. He was a fierce opponent of individualism and political liberalism and saw the fascist movements as a triumph of public order and the needs of the national collective over petty individualism. On the other hand, he was also an elitist who abhorred the idea of mob-rule and saw democracy as a threat to good governance and public order. After the Blueshirt movement began to falter in Ireland, he distanced himself somewhat from his previous views but maintained a preference for authoritarian and nationalist leadership. In 1936 his Oxford Book of Modern Verse, 1892–1935, a gathering of the poems he loved, was published. Still working on his last plays, he completed The Herne’s Egg, his most raucous work, in 1938. Yeats’s last two verse collections, New Poems, and Last Poems and Two Plays, appeared in 1938 and 1939 respectively. In these books many of his previous themes are gathered up and rehandled, with an immense technical range; the aged poet was using ballad rhythms and dialogue structure with undiminished energy as he approached his 75th year. Yeats’s first book of poems, The Wanderings of Oisin and Other Poems, was published in 1889. In the long title poem, he began his celebration of the ancient Irish heroes Oisin, Finn, Aengus, and St. Patrick. This interest was evident also in his collection of Irish folklore, Fairy and Folk Tales (1888). His long verse drama, Countess Cathleen (1892), was a combination of modern dramatic forms with ancient beliefs and modern Irish history. He followed this with his collection of romantic tales and mood sketches, The Celtic Twilight (1893). Yeats’s Secret Rose (1897) includes poems that he called personal, occult, and Irish. More figures from ancient Irish history and legend appeared in this volume. The Wind among the Reeds (1899) won the Royal Academy Prize as the best book of poems published that year. Yeats continued to write until his death. Some of his important later works include The Wild Swans at Coole (1917), A Vision (1925), The Tower (1928) and Words for Music Perhaps and Other Poems (1932). By early 1925, Yeats’s health had stabilized, and he had completed most of the writing for A Vision (dated 1925, it actually appeared in January 1926, when he almost immediately started rewriting it for a second version). He died in Roquebrune, France, on January 28, 1929. He had retired there because of ill health. In September 1948, Yeats’s body was moved to the churchyard of St Columba’s Church, Drumcliff, County Sligo, on the Irish Naval Service corvette LÉ Macha. The person in charge of this operation for the Irish Government was Seán MacBride, son of Maud Gonne MacBride, and then Minister of External Affairs. 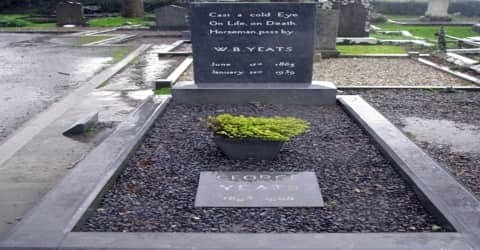 Yeats was not only one of the greatest poets and a major figure in the Irish literary renaissance (rebirth), but also wrote some of the greatest of all twentieth-century literature. Yeats is commemorated in Sligo town by a statue, created in 1989 by sculptor Ronan Gillespie. It was erected outside the Ulster Bank, at the corner of Stephen Street and Markievicz Road, on the 50th anniversary of the poet’s death. 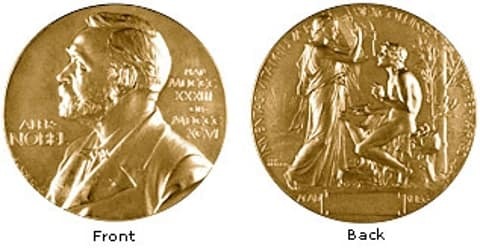 Yeats had remarked, on receiving his Nobel Prize that the Royal Palace in Stockholm “resembled the Ulster Bank in Sligo”. Across the river is the Yeats Memorial Building, home to the Sligo Yeats Society.